I have updated the plugin and the makefile for Arduino 1.0. These updates can be found here. Thank you very much for the post and the plugin! I’ve been looking for something like this for sometime and very happy came across your work. I’d would like a bit more of your help, because and I am using your plugin on Windows. And some issues have arisen. First. There is a Resolve Missing Tools, that for now I solved just clicking OK.
make: Circular applet/Documents <- applet/Documents dependency dropped. make: Circular and <- applet/Documents dependency dropped. make: Circular and <- and dependency dropped. 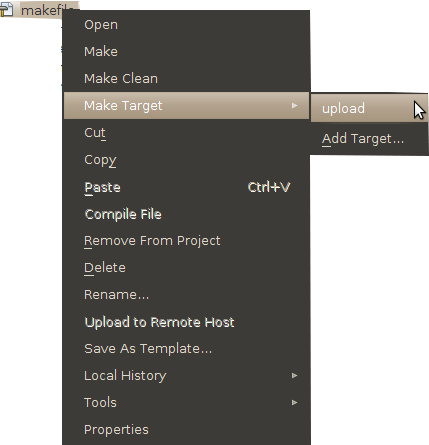 make: Circular Mis <- applet/Documents dependency dropped. make: Circular Mis <- and dependency dropped. make: Circular Mis <- Mis dependency dropped. I hope you can help me with these questions and I am very grateful in advance for your time and possible help. First, thanks for trying the plugin on Windows. After looking at your errors, I am suspecting that your problem was probably caused by the differences between how NetBeans platform behaves on Windows and Linux. For instance, there are many places in the make file that are platform dependent. You will need to install cygwin on Windows for those linux-only portion to work properly. If you could give that a try and let me know your results, I can help you further trouble-shoot the problem. Thanks. Excellent post! I don’t develop for Arduino yet, but it’s nice to know that my favorite IDE supports it somehow. BTW, nice skin! Where did you found it? That’s the default Ubuntu 10.04 theme. I like it too. Cool plugin and I’d love to start using it, but I can’t seem to get Netbeans to play nice on my setup (Ubuntu 10.04 64bit). It just keep running my (dualcore) CPU up to 200% and does nothing. How did you get it to work? Since I’ve switched back to good old 6.7.1 your plugin won’t install. Looks like it could be some version conflict… did you update your NetBeans IDE (Help->Check for Updates) after you installed your IDE? Besides this warning message, did it work? I can see code and syntax highlighting but I don’t have code completion working. I’ve followed step by step your instruction and triple checked all option…what I’m missing about you? There’s a way to have automatic suggestions? 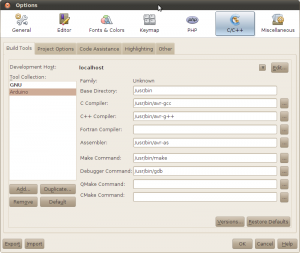 Did you setup your include paths under Options->C/C++ Code Assistance TAB? I’d double check the settings there. 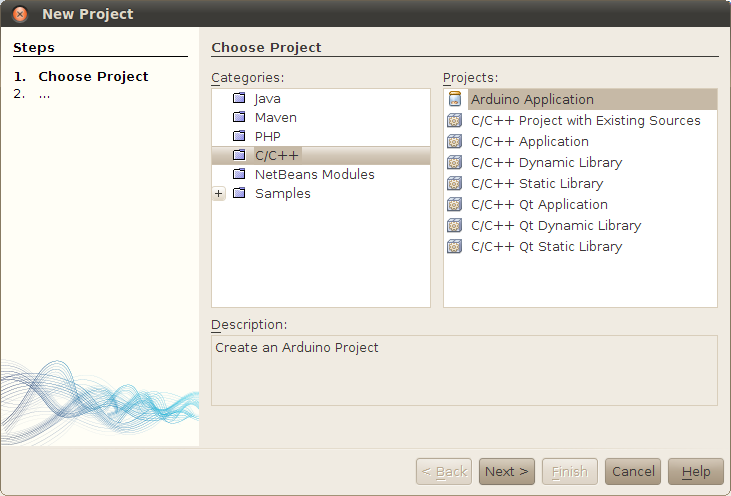 If I write code for arduino into netbeans I have to change something? The makefile supplied with the plugin does not contain include paths to all the libraries. If you are using libraries that are not defined in that file, you will need to add the corresponding library to the C_MODULES or CXX_MODULES variables in the make file. And you may need to add the library path to CINCS and CXXINCS as well. I’m not in trouble compiling (not now…) I’ve trouble coding. Netbeans mark RED underline on the code line I’ve told you. Crash, if you can compile successfully the red underline simply means that the IDE could not find the definition of the method/classes you are using and that usually means you will have to setup the Code Assistance paths (or you could just ignore it). But if you cannot compile the code (e.g. the compiler is complaining about not recognizing the underlined code) it means that you will need to include the include path. Hope it helps. Do you have any idea on what I might be missing for those libraries? If you look at the parameters to -I, do they show the correct paths? No mention of wiring_pulse at all. Any ideas? And it should fix your problem. Good luck! The C_modules were all there. Could this be an issue with Netbeans 6.9? Highly unlikely… did you try all the paths in the output window as I suggested? I’ll give 6.9 a try as well. I don’t have any of these problems if I compile with the Arduino 019 IDE. I have also tried the same thing using eclipse setup for AVR and have the same results. Blink will compile, nokia 3310 lcd example will not because of scope declaration errors. Did you copy the nokia_3310_lcd library to your arduino\library folder? And also you will need to modify your make file (see my previous comment) to make sure that the library sources are referenced in either C_MODULES or CXX_MODULES depending on whether it’s c++ or plain c code. Are you able to compile the example? I’m having problems using the Nokia 3310 LCD library. It seems that the plugin cannot find the library, though the lib is in the arduino library path and the path is added to the makefile. The attached ArduinoPlugin_v1.0.tar.gz (towards the end of the article) should expand to ArduinoPlugin_v1.0.nbm and you can then use Tools->Plugins to import it. Did you try adding the plugin? I got everything working so i can compile and upload through netbeans. puzzled as to why intellisense doesn’t work for Serial.begin(9600). Any help on this? I installed netbeans version 7.0 and I cannot configure the avr tool chain.. Under tools->options it doesn’t have a C/C++ tab. And I can’t find anything similar whatsoever. Have anyone tryed this in this new Netbeans version? I have not tried this particular version, but there should be a version of NetBeans that is for C++ Development? As this steps didn’t work for me (NetBeans couldn’t find pins_arduino.h, wiring.h, etc), I spent the last hour trying to figure out what was wrong and it was a simple thing after all and I would like to share it with you people! Mr. Wong made this using version 18 of Arduino IDE but…If you’re using a different version of Arduino IDE you have to change that parameter in the makefile! As I’m using version 22 of the Arduino software, under the makefile – in line 40 – instead of “INSTALL_DIR = $(HOME)/arduino-0018” I now have: “INSTALL_DIR = $(HOME)/arduino-0022”. But that’s not the end of the road for me… I cannot upload the sketch to the Arduino board. When I go to “make target”, the only options shown are: ‘all’, ‘build’ and ‘clean’. When I try to use an Arduino library, for example ‘#include ‘, it says that OneWire.h could not be found. This happens with every single library. I’ve also tryed to use Arduino v18 as you pointed out but still no go. Any hints? I’ve tryed different baud rates (19200, 57600 and 115200) and I also tryed stk500, stk500v1 and stk500v2. When you tried to upload what was the output of the command line used? The output is what i’ve written in my last comment. I’ve added the following to the CINCS and CXXINCS lines: -I`pwd`. I also changed the baud rate to 57600. Now it works! I can only upload it through the terminal but it’s fine for me. I’m sorry to saturate your page with comments but I have one more question to you! Each time I create a new project, I have to copy the makefile from one of the last projects (’cause the original one does not work for me). Is there any way to make my makefile persistent to any new arduino projects? 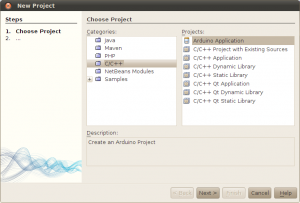 I modified de Kerry’s plugins for use it with Netbeans 7.0.1 and Arduino 022. This tutorial propose also a command for easily monitoring of the serial connection of Arduino. I hope you can give me an idea of what to do. My understanding is that v1.0 has changed quite a bit from the previous versions. I will need to take a look to see if I could make it compatible with 1.0. Stay tuned. Thanks for providing a great utility. It all worked fine for me with one exception. I can build hex files but do not get the option to upload them to the board. I get the options to make, make all, make clean and add target. Any suggestions as to what needs changing would be appreciated. I am using Ubuntu 10.4 and Netbeans 7.1. You will have to add the upload option manually by right clicking on the makefile and choose Make Target->Add Target and add the upload target name. Then you can right click and choose upload to upload the hex file generated. good work. I really appreciate it. Make runs through without errors. Why does the compiler complain about the statement ‘Serial.begin(9600)’ with: ‘Unable to resolve identifier Serial’ and finsih compiling flawlessly ? How can I configure that F11 builds executes the ‘make all’ ? If it compiles correctly but the IDE does not recognize some keywords, it means that that the code assistance can not locate the header file. You will need to add the path to the library header files in Options/C/C++/Code Assistance if I remember correctly. As to how to make F11 work, I don’t know if you can without writing some kind of plugin code. Im interested in building this project but i do not know how to make changes in the header files to make it compatible with the Arduino IDE. Ive also read the instructions above but i do not have a linux computer to do this. Could you provide a pde file that I can just copy paste and upload to the arduino mcu?? I would really be thankful.